Prime Minister Justin Trudeau is promising a fundamental rethink of how the federal government recognizes Indigenous rights and title in this country — vowing to work with Indigenous partners to develop a new legal framework to better foster a spirit of self governance. Prime Minister Justin Trudeau is promising a fundamental rethink of how the federal government recognizes Indigenous rights and title, vowing to work with Indigenous partners to develop a new legal framework to foster self-governance. In a 15-minute speech in the House of Commons that was short on concrete details, Trudeau said he wants to give new life to Section 35 of the Constitution Act, 1982, which recognizes and affirms Aboriginal and treaty rights. Trudeau said governments have ignored these rights entirely for too long, leaving it up to the courts to define them one decision at a time. "Instead of outright recognizing and affirming Indigenous rights, as we promised we would, Indigenous Peoples were forced to prove, time and time again, through costly and drawn-out court challenges, that their rights existed, must be recognized and implemented," Trudeau said. Generally, Aboriginal rights have been interpreted to include a range of cultural, social, political and economic rights, including the right to land, to fish and hunt, to practice their own cultures and to establish treaties. Trudeau said a rethink of Aboriginal rights will allow Indigenous peoples to pursue greater self-determination, with the ultimate goal of addressing entrenched economic and social problems in Indigenous communities. "We need to get to a place where Indigenous peoples in Canada are in control of their own destiny, making their own decisions about their future," Trudeau said. To that end, the prime minister said his government will develop a new "recognition and implementation of Indigenous rights framework" through consultation with Indigenous and non-Indigenous Canadians. "This framework gives us the opportunity to build new mechanisms to recognize Indigenous governments, and ensure full and meaningful implementation of treaties and other agreements," Trudeau said. The prime minister said consultation on the new framework will continue throughout the spring. The plan is to introduce legislation later this year, with full implementation ahead of the next election in October 2019. The plan announced by Trudeau Wednesday follows on some of the recommendations of the Royal Commission on Aboriginal Peoples (RCAP), a report that dates back to the 1990s — in particular, its call for the federal government to help foster autonomy by moving communities away from the restrictions of the colonial-era Indian Act. "Aboriginal peoples have preserved their identities under adverse conditions," the final RCAP report reads. "They have safeguarded their traditions ... they are entitled to control matters important to their nations without intrusive interference." The basic unit of government in most First Nations today is the band, a creation of the Indian Act. A band usually includes only a portion of a nation; First Nations people who lost status or did not qualify for status under the Indian Act are often excluded from their own communities. As a result, the RCAP found that most of the existing bands are simply too small for effective self-government. "Only at the nation level will Aboriginal people have the numbers necessary to exercise a broad governance mandate and to supply a large pool of expertise ... only with nationhood can Aboriginal peoples recapture the broad sense of solidarity that predated the relocations and divisions of the Indian Act era," the report concluded. Trudeau said the federal government is prepared to support Indigenous efforts to rebuild nations, leaving them better equipped to take on the responsibilities of self governance. "We have a chance to develop new tools to support the rebuilding of Indigenous communities, nations and governments, and advance self-determination, including the inherent right of self-government," Trudeau said. 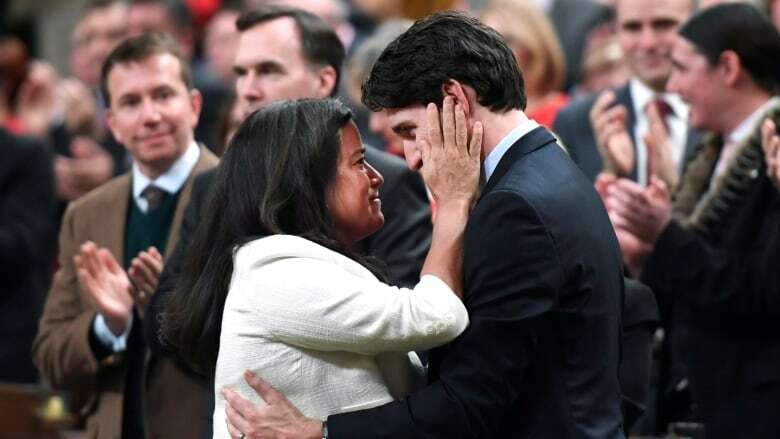 Justice Minister Jody Wilson-Raybould, a former Assembly of First Nations (AFN) regional chief, called the prime minister's announcement "absolutely historic." "What our prime minister is doing is ensuring that Section 35 [of the Constitution] is a full box of rights to be filled up by First Nations, Metis and Inuit across the country," she said. Wilson-Raybould said the government wants to empower Indigenous communities to have "control of their lives," so they can "draw down jurisdiction." In plain terms, that means devolving jurisdiction from other levels of government to Indigenous communities so they can provide services like child welfare, education and health care to their own people, or craft their own laws on everything from elections to fisheries. "This is complicated. This is undoing 150 years of the colonial legacy of the Indian Act that has sought to control the lives of First Nations peoples from the time they're born to the time they die," she said. "We have 150 years of where First Nations people have been left out, and do not see themselves in the constitutional framework of our country." Development of this new legal framework will fall to Crown-Indigenous Relations Minister Carolyn Bennett, who already has sought to encourage the devolution of some services to Indigenous nations in the name of self-governance. Last fall, for example, she negotiated a landmark deal on education with the Anishinabek Nation in Ontario — something the government hopes to replicate in other jurisdictions. Trudeau shuffled his cabinet last summer and split the Indigenous Affairs portfolio, tasking Bennett with settling outstanding comprehensive land claims (there are nearly 100 such deals in the pipeline, at various degrees of progress), clearing a backlog of grievances at the Specific Claims Tribunal and generally fostering a new era of self-governance. In response to Trudeau's speech, Cathy McLeod, the Conservative party critic on Indigenous issues, cited the former Harper government's accomplishments on this file — while cautioning the Liberals against being too ambitious. "There's always room for improvement in Canada's approach to Indigenous peoples ... but this Liberal government in particular has had significant difficulty delivering on the lofty commitments it makes," she said. "This government has too often fallen short even in their brief time in office." NDP MP Romeo Saganash said he welcomed the prime minister's commitment to better define Section 35 of the Constitution. "While I appreciate the prime minister's words today, we need to make sure that this time it is for real," he said. "One of the most unacceptable things politicians can do is quash the hope of the most vulnerable in our society. We've faced 150 years of broken promises. Guess what? We will not let that happen again for the next 150 years." Trudeau's speech comes in the wake of Friday's contentious not-guilty verdict in the trial of Saskatchewan farmer Gerald Stanley in the shooting death of 22-year-old Colten Boushie. The verdict inspired angry protests across the country and prompted the prime minister and Wilson-Raybould to issue statements in support of Boushie's family.